Relive the days of classic gaming with The Filmmaker, a puzzle-filled text adventure that pays tribute to the classic, cheesy Hollywood B-Movie! It plays like an interactive novel. You make choices that determine what happens next in the story. 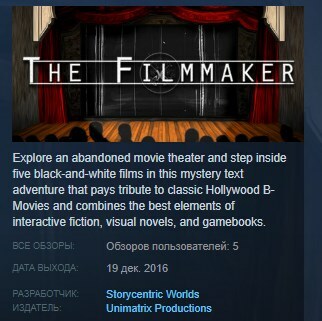 But unlike in traditional gamebooks and visual novels, The Filmmaker also features more advanced adventure-based game mechanics, including locations to explore, items to interact with, characters to meet, and puzzles to solve. Unfortunately, the theater closed several months ago after a series of gruesome murders. This came as a huge disappointment to Brianna, a young B-movie buff who faithfully attended every new showing with her recently-passed father. PLAY 6+ hours of content--a true “B-movie” experience!